All my ui's needs to be extracted to desktop first. 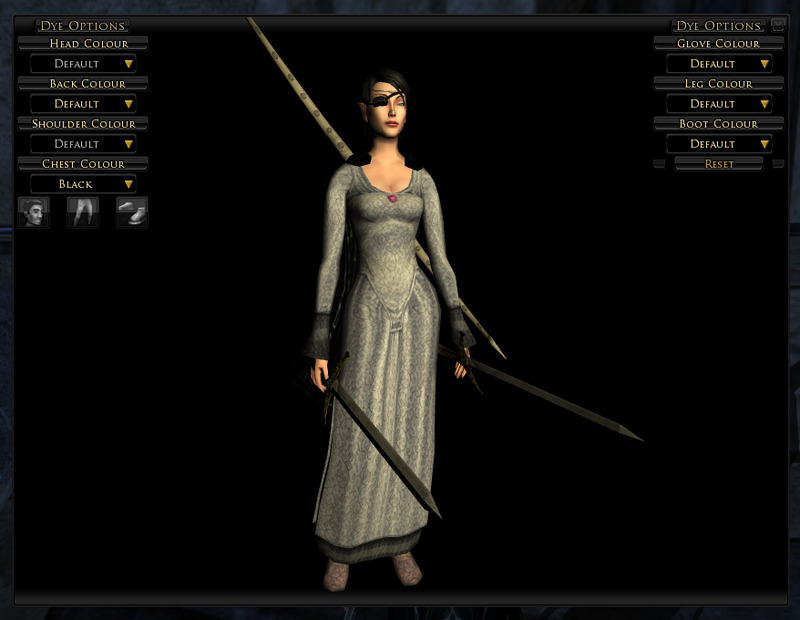 Version 5.0 and up is brand new version due to changes of Isengard with new skins and new codes. B.G.M V-4 and below are no longer supported due the major changes from Isengard. 5.2 is a quick fix,sorry I forgot to restore the champions and hunter focus bars to normal. Was using my mini toolbar skin art for it and accidently zipped it with it. Fix some vitals for target of the target,fellowship and followers vitals. Added a folder called "OPTIONAL",this folder contains some optional patches for B.G.M 5.1. Each folder will contain a readme file info about each optional patches,this are provided by feedbacks and suggestions. I have re added or patched the menu buttons back to normal. On 5.0 the menu buttons had a white or bright line in the middle of the icon,this has been removed by request. Also on the deed page I have removed the white line thats middle of the location art. Epic - Class - Dunland - Moria. Previously the names or the letters were to far apart of each other,I have the close them together to each other now,Thanks Taangar for pointing this out. Speaking of patches,you dont need to download the patch "B.G.M Patch Blue V5V1" I posted some days ago on Nov 7 2011. This UI is already contain all the fixes that was on that patch zip plus the optional folder is also included on this UI zip. 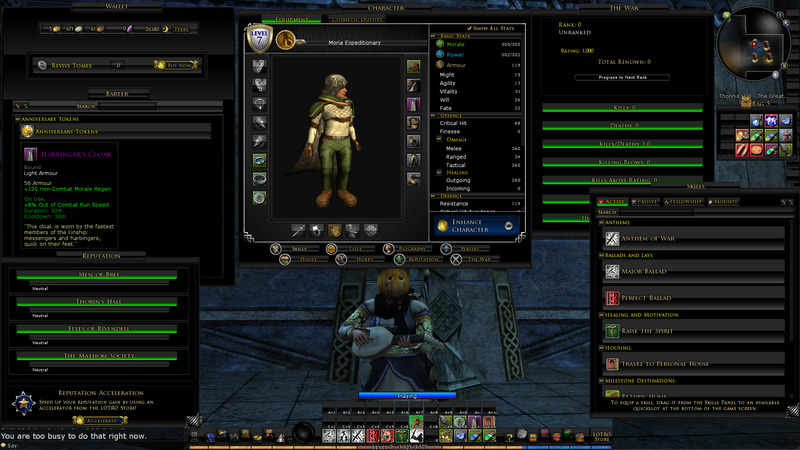 By request I re patched the highlighter for your skill bars and inventory when you mouse over items or button. This has been patched back as it was in 4.3,previously I had made it darker on 5.0. Added over 200 skin arts and some are updated. Fixed the music progress bars,I have removed the skin art and just left it as clean bars like the progress bars. Horse bars when racing,I have removed the skin art and left them as clean bars as the progress bars. This should give you more viewing area for small monitors. Re added skin art for my B.D.R.X for zooming head,chest and feet. Reskin most of panel art,other areas I removed them to give it a nice clean look on paragragh letters. Example I removed the background skin art for NPC quest dialog,this should be easier to read now. Fixed and added deed tabs for the new area. 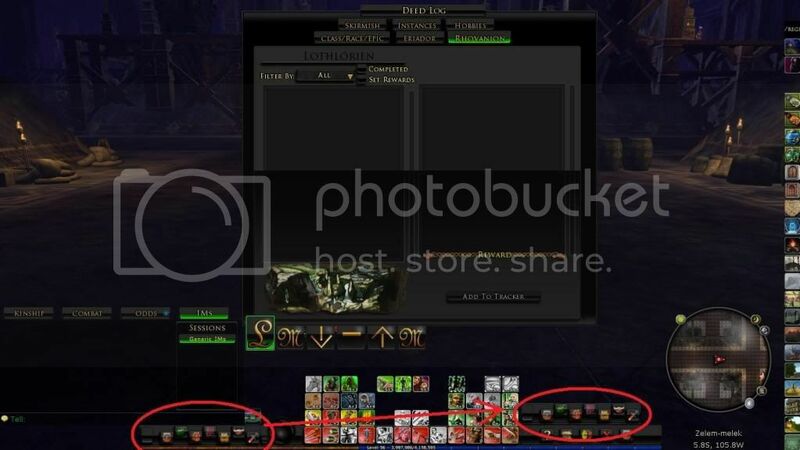 Major changes to the trait virtue page panel,I have re organize the icons and progression bars. They are in alphabetical order in English,this should give you a quick access to each virtue icon instead of mouse over each of them to see what they are. There some minor skin art fixes here and there which was not to much noticeable but fixed them anyways. Transparent Gambit boxes for mini look. Please use either 7-zip or peazip to extract my UI's. Do not use the built in windows zip program,my UI are compressed very high and windows cannot extract all the UI correctly. If you have winzip or winrar,make sure you have the latest version to be able to extract my UI's. Z-zip(4.65) highly recommended and its free. Peazip and alternative to 7-zip and its free too. MrJackdaw-Yeah I remember that pm. percman ec 20 2009 Thanks for your skin definition file and hard work. Any one else I have missed to mention(sorry). Hi I'm back working on my UI again. Sorry for late news about my UI but I came here to let others know that my UI is not dead and I'm currently updating it. I'm currently working on the purple first since Oct 17 2012. I just wanted to let you all know I just published a compilation skin named JRR which includes 11 tribute addons. B.G.M is one of these. The BGM original mainbar (and start menu) can be displayed within the main theme interface. PS : Brygard rules ! Last edited by Adra : 07-16-2011 at 10:10 PM. Finally have finished at 2:50am ct.
Hey Brygard! Still loving your UI but I was curious if you could help me out (yet again lol). I just recently upgraded to an external monitor with my laptop and wanted to know what I would have to edit on the skindefinition file to adjust the UI you edited for me to fit a 1680x1050 screen resolution? Ok cool, thanks for the info and I kinda figured it was going to be a giant headache lol. I will take a look at main base UI and see what I can do lol. EDIT: I was going to look at the base UI but not after I started the download lol. From your previous comment, I knew the file was a bit larger than most but I am currently running on a wireless connection (still surprises me I can play the game successfully lol) in Europe and I didn't feel like waiting 7+ hours for the download rofl. Last edited by Thayilis : 01-26-2010 at 02:04 PM. To do all that would require adding more codes but you have to find the corresponded codes for it and that would take me some days to figure it all out. I'm no coder I just do the basics stuff,the only advance stuff I ever did was the mail config which I believe was the first guy to introduce it here where I moved the buttons and then the toolbar which those code been here since begining and then the dressing room was the biggest coding and trimming work for me which is also the first to be introduce here and now this new toolbar codes. I'm sorry to say that at the moment I wont touch those frame codes cause I have to look through the skin dictionary on the zip pack. The skin dictionary is 1.7mb and the total line codes are @ 21971 codes of line that I have to look through. Heh,it's not fun looking all those codes all day and figure out what work with what frame. You can download the zip pack for the main base UI to work with and open the text file called skindictionary and take a look at it. Yeah you can use the toolbar with the other colors of my UI just do the same steps on the readme. Last edited by Brygard2007 : 01-26-2010 at 01:27 PM. Edit: I just loaded it up and it looks fantastic! Thanks again so much! Sorry for the long-winded-ness of this and I hope you can help with a resolution that doesn't require you to re-write your skin definition file again on my account lol. Thanks again for all your help Bry! Oh! one more thing, would I use the same process for the other colors to use the modified tool bar? Thanks again! Last edited by Thayilis : 01-26-2010 at 11:46 AM. Sorry for the delay,true be told I wasn't feeling up to do anything this last weekend plus was visiting my family. Anyways since 10 pm last night Monday I been working on the toolbar today and finally have a workable code that doesn't seem to break the UI toolbar. I removed the junk code and took me a long time to figure out why I coul'dnt move the darn xp letters. But I think I got it now,the code very different from other authors,I structure it differently. Readme is in the zip. As requested this for only 1366x768 resolution which I found out its for TV LCD. Make sure you have the scales of the UI to default. Hey Brygard! I was just curious when the mini version of your skin was going to be updated. I have been using your UI for a bit now but because of my retardedly small resolution the toolbar is a bit too big for my tastes . Thanks again for the great UI! Hey Brygard! I really appreciate your help with this . I am running the game in 1366x768 resolution and playing in full screen. At the moment I'm not too worried about the whole toolbar conifg glich because I don't normally go back and forth from windowed to full screen . Even though I'm not playing in windowed mode, I will paste the windowed resolution anyway, in case someone else is and they want to try this out . One last thing though...I use a variance of your skin colors and was wondering if the mini movable toolbar will be updated for all your colors? And thanks again, I think its really awesome that some of you guys that create this skins are so cool with changing things and updating them so regularly for people! To be able to do that you will need to install my mini toolbar movable mod which is currently is not updated yet for S.o.M. Now that I finish with my mod(B.D.R.X), I'm now in the process of updating the mini toolbar. I need to ask you some questions first. What resolution your playing at? Are you playing in windows mode or full screen mode? If your playing in windows mode I will need 1 code from your user preference. 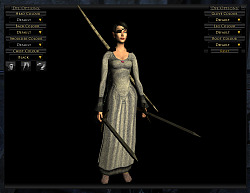 Go to your documents and the folder for Lord of the Rings Online,look for the usereprefrences and open it up with notepad. I will need those numbers and paste it here so I can run the same windows mode resolution for me to config the code. About being hard,no it's not hard it's just bit time consuming to do. 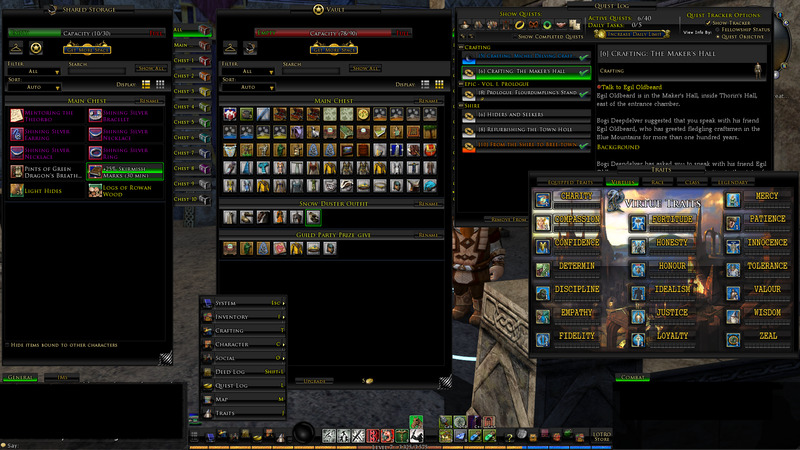 some codes from Percman and Goldnessel for the toolbars and I need to update those too. Also you need to know something about using toolbar config codes. There's a know problems when you exit full screen to windows mod and back in forth. The toolbar will stay stuck either in middle of the screen or lower. Example I run my game in 1920x1080 and decide to switch to windows mode and goes to the resolution say 1280x720. When you go back to full screen the toolbar will be stuck in the middle of the screen,to fix it you will need to exit the game and relog. As stated,this known problem for any UI that uses toolbar configuration code. I just updated the green version for S.o.M (3.1),enjoy and thanks for using my U.I. Hi all and sorry for the delay. The green Ui is now updated and ready to download and thanks again for your feedbacks. Ty for the tip, ill be sure to do that.